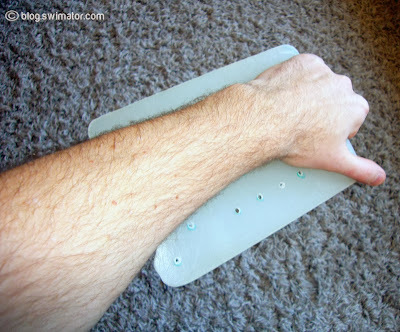 1) Strappless paddles - Even though they are used on your hands, they serve an additional purpose. By taking the wrist straps off or using the strapless paddles (ex: Agility paddles from Finis) you basically are more inclined to lose them from your hands if your underwater stroke has some unexpected deviations form the straight pull. The paddle only attaches to the tops of your middle finger(s) forcing you to think about what your hands do. 2) Kickboard - You don’t necessarily need to use a kickboard to do your kicking. Just hold onto one paddle with your outstretched arms and voila. Many swimmers press down on the kickboard when they kick which is not good. You need to be gentle and relax in your shoulders, so the water can carry you. The kickboard is there just to guide you, so using hand paddles instead of it, is a great practice to steady those front arms. Keep your face in the water and when you breathe, keep the paddle without going down. 3) Lopsided swim - This one is a lot of fun. For this you don’t need to put your paddles on different appendages as above, but you will only use one paddle on the hand of your choosing. By using a single paddle, you are basically offsetting the balance in your core body, so one side of your core is forced to work that much harder to keep your body from snaking around the swim lane. You can also make it more interesting and add one flipper to the opposite leg :). 4) Sculling - Either put the paddles on the normal way or just grab them between your thumb and your fingers and utilize their surface to make your sculling efforts a bit more challenging. Remember, sculling movement is not a breaststroke movement, just do very narrow figure eights from side to side and feel the water pressure on your skin. The pressure is the same the entire time, refrain from putting a lot of pressure pushing out to the sides and easy bringing your hands back together. 6) Catch up swim - There is no need to put on your paddles for this exercise, but you can definitely utilize them in a different matter. As with the kickboard paddle exercise, just hold one or both paddles in front of your body in one hand and every time you bring your moving arm forward, just replace your grip. This catch up drill is great for working on your underwater catch. Keep those paddles submerged below the surface, so you always have your hand below your elbow in terms of how far they are below the surface. 7) Breaststroke kicking - If you adjust the paddle straps in a bit different way you can slip the paddles onto your inner ankles and use them to increase the surface area of your foot during your breaststroke kick. Thus giving the correct idea of how it should feel when you push off the water with your inner legs. This is a bit more tough to do properly and not all paddle straps are long enough to achieve this foot fit. If you do go after this, I suggest getting a smaller set of paddles which you dedicate specifically for this. NOTE: I don’t recommend you try this while swimming very hard as it puts a lot of pressure on your knees, so you could end up with an injury right after you spend an hour adjusting your paddle straps :). Patiently and slowly to start with. 8) Splashing your fellow swimmers :) - Since paddles have larger surface, it is very easy to throw larger amounts of water at your swimmer friends or even the onlookers outside of the pool. Try it, it is fun :). You can even make huge water bubbles on top of the water, but about that another time. And there you have it. 8 ways to utilize your hand paddles without having to spend money on additional swim equipment. 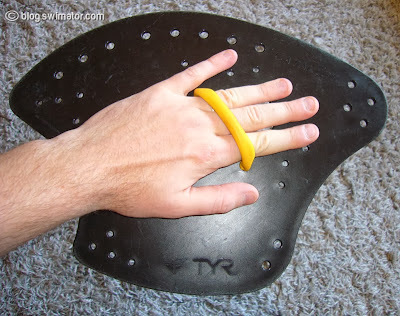 You can actually just have one entire workout with your hand paddles without putting stress on your shoulders. So, if you were a skeptic about hand paddles, maybe you can re-evaluate your position and be creative. Now it is time to dust off those good old plastic plates and get in the pool to enjoy them once again :). If you have any other uses that were not mentioned here, please do share. I'll be happy to include them.